This is a very simple project in which you put together a simple speaker circuit that can work with any standard speaker jack such as on a computer or a CD player so that you can hear sounds from these devices. This project is very basic in design and in the end, it will not look pretty, but you'll learn the basics about speakers and know more about how they're connected to give sound output. Next we deal with the 3.5mm plug. The type that you see being used with this project is a mono plug; it only has two contacts. However, a stereo 3.5mm plug can also be used. For this experiment, it doesn't matter. The 3.5mm plug may come in many fashions. It may be a 3.5mm male to male plug, a 3.5mm male to female cable. We are not interested in the other side, only the male side. What we're going to do is take the 3.5mm plug and cut it at any part of the wire. This should expose two wires, a wire which represents the positive side of the male plug and a wire which represents the ground of the male plug. This is now the completed speaker which can be used with any standard speaker jack whether on a computer, CD player, etc. All you have to do is place the speaker into the speaker jack and you should hear sound output if the device is powered and playing sound back. Although speakers do not need power in order to work, they do need amplification. 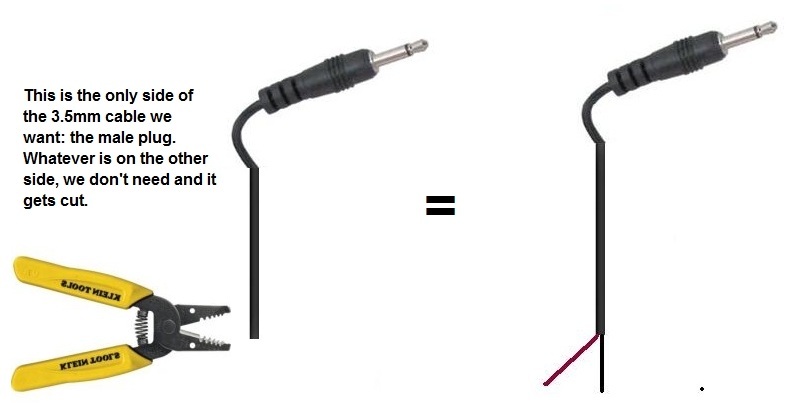 This is why it must be plugged into a speaker jack, which is equipped internally to provide amplification to the speaker so that it can play out sound with enough volume for a user to hear. So great, you now know how to build a simple speaker circuit.